Please use the form below to send me a message if you're having trouble with the site or just have a question. I'll try and respond as soon as possible. The first thing you'll need to do is add your debt account information so Undebt.it can show you when you'll be debt free. The Account List is where you go to add or edit your account info. You can add as many debts as you want, there's no limit. All of the debt management tools are located in the in the My Debts menu item towards the top of the page. This menu item is only visible when you are logged into your account. The Dashboard page is where you'll be spending most of your time once you get going. You can quickly & easily record your payments and see a summary view of your accounts. (Optional) If you want to see how much of an effect a higher monthly payment will have on your debt free date, just change the budget amount on the Debt Snowball Table page, you can always change it back at any time. Make sure your monthly budget amount is more than the total of your minimum payments for this to work right. You can also change your budget on the My Account page. (Optional) By default, [sitename] uses the standard Debt Snowball payment method, which is when the accounts with the lowest balance are paid off first. You also have the option to use the Avalanche method if you like; it pays off accounts with the highest interest rates first. Try them both and see which one works best for you. You can also choose to use one of the other supported methods, like the custom payoff plan if you like. The Debt Snowball Table page shows the detail of each months' payment and will help you visualize your payment schedule. The Debt Comparison page shows you the payment plan and debt free date for each of the methods using your actual account info. After you've been using the program for a while, be sure to check in on your payoff progress. This page shows you several pieces of important information in one place. The main part of the page shows you progress bars for each of your account along with an overall progress graph. The second part of the page shows you some distribution information about your debts; like what type of debts they are and what type of interest rate percentages you are paying. 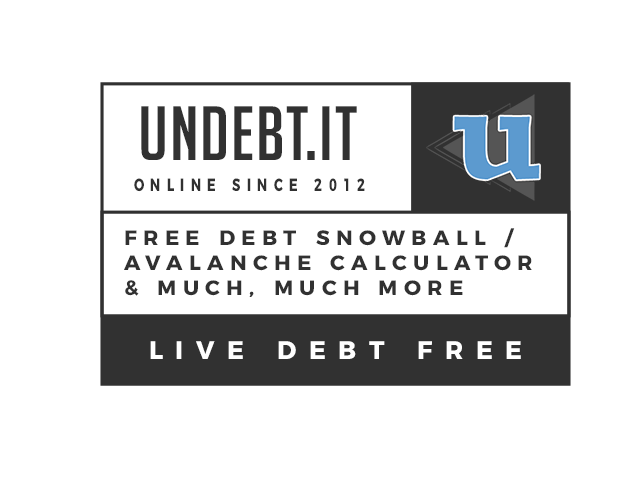 (Optional) Turbo charge your personal finance management with Undebt.it+. For a very small yearly fee, you can get access to the complete suite of applications and bonus features on the site. The fees collected from the sales of memberships help pay for website hosting costs and other expenses. There's a free, no obligation 30-day trial you can enable to see if Undebt.it+ works for you. Undebt.it+ offers access to the bill management module which allows you to keep track of your recurring, non-debt monthly/yearly bills. Bill management supports recurring bills every x months or years. Autopay support is in there too, so you don't need to manually create bills and payments. There is even a 52-week savings challenge component as well. See the How to Use the Bill Management Module blog page for more details. Visit the FAQ & Help Center for the answers to common questions. You can also download the Undebt.it user guide. It has plenty of step-by-step instructions and screenshots. @undebt_it I'm in Vegas at #MicroConf 2019. Stop by and say hi if you're here too.